Factory Sealed 2014 Upper Deck Football Hobby Box mit 20 Packs a 6 Cards per Pack. 3 Autogramme per Box und 2 Rookie Cards !!! 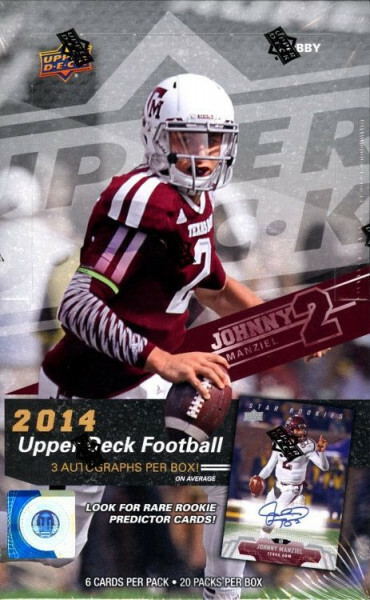 Produktinformationen "2014 Upper Deck Football Hobby Box"
Find One Rare Base or Star Rookie Paralle Numbered to 10 or less and Two Star Rookie Variation SP's Per Case! Find 2-3 Star Rookies in every PACK! Find College Tribute Patch Cards! Capture famous traditions and tributes throughout college football! At least Four Per Case! Look for 1970s/1980s College Football Heroes inserts falling 1:10 packs! Collect the 12-card set! Look for rare QB, RB, and WR predictor cards for your chance to win exclusive card sets! Weiterführende Links zu "2014 Upper Deck Football Hobby Box"
Fanbewertungen für "2014 Upper Deck Football Hobby Box"